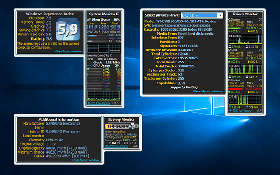 ﻿ Windows10Gadgets.pro - Homepage - Free Desktop Sidebar Gadgets for Windows 10/8.1/7. Become who you are. Use Windows 10 Gadgets for Real Geeks. Make your desktop come alive. All our Sidebar Gadgets are clean & free from any additional Adware Software! — Please consider disabling your Adblocker (if any) to support our hard Work. Thank You! New - Follow us on Twitter. 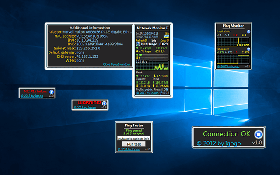 MUST HAVE PC & SYSTEM MONITORING GADGETS. These small, but very useful utilities, will help you control the operation of your computer and easily manage it. You can check many parameters of the CPU, video card, disk drives, laptop battery and, of course, the processes that are running. Also, some gadgets provide the ability to perform automatic actions identical to the Windows task scheduler. FOR REAL GEEKS ONLY — INTERNET & NETWORK MONITORING GADGETS. Use all possibilities of internet agents with maximum effect and minimum effort. With this Windows 10 internet gadgets you can check your network in a minute. You can monitor your connection and/or NIC status, external IPv4/IPv6 address, DNS, MAC address and much more. Use any browser straight from the desktop and gain any important information you need in a few seconds. These mini-applications can be very useful helpers. Works with wired and wireless network. DIFFERENT TOOLS & UTILITIES MAKE YOUR LIFE EASIER. 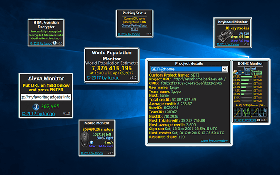 In this section you will find a collection of tool and utility gadgets for your work, including HTML Decryptors, different monitors, etc. Also you can find here a very useful gadget to switch between 64-bit and 32-bit Sidebar. It may help you use some 32-bit gadgets on your 64-bit OS. Choose the gadget that you need, download and install it and see how effective it may be. SINGING IN THE RAIN — LEARN THE WEATHER ANYWHERE. Our Weather gadget for Windows 10 allows you to find the current weather condition of any location, your home town or any location on the Earth. You can also see the weather forecast days ahead. Ultraviolet index will warn you about the need to protect the skin, if you plan to stay on the street for a long time. Geomagnetic storm details is also provided into a fly-out window. THE RUNNING MEN — SYSTEM UPTIME CLOCKS. Do you need to know how long your system is operating without reboot? Then this section is for you. 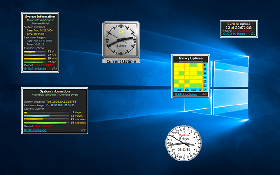 You may choose whichever Windows 10 desktop uptime clock you like the most: combined bar and digital uptime clock, peculiar binary uptime clock, digital uptime clock or analog one. Also you can save and see record value. All gadgets are easy in use. They have intuitive layout and overall simplicity. THE RELATIVITY OF TIME — DIFFERENT CLOCK TYPES FOR YOU. 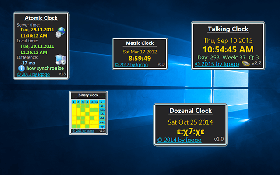 Fancy and unique sidebar clocks designed to enrich your Windows 10 desktop. You may choose the clock you like the most: digital clock, metric clock, dozenal clock, modern binary clock or even a speaking clock. All clocks are easy to use and have various designs and colors, can be fully customized. An atomic clock gadget to synchronize your computer clock with precision atomic time is also available. Many people including myself still love the desktop gadgets that were introduced in Windows Vista. They were removed completely in Windows 8 which made many people unhappy. If you cannot imagine the Desktop without your favorite gadgets, we'll help you get them back. Luckily Microsoft has only eliminated the software for playing gadgets from Windows 10, but nothing can prevent us from bringing it back. Merely use one of reliable third party applications. Follow the instructions and your Desktop will be alive again. PAD or Portable Application Description is a machine-readable document format and specification designed by the Association of Shareware Professionals and introduced in 1998. PAD allows software authors to provide standardized product descriptions and specifications to online sources in a standard way, using a simple XML schema that allows webmasters and program librarians to automate new program listings and update existing listings in their catalog. PAD saves time for both authors and webmasters, while allowing the specification to support the latest changes to operating systems and hardware. 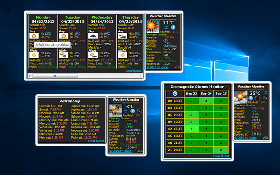 Tovarysh Bushyn, I wanted to thank you for your weather sidebar gadget. It works well in Windows 10 via the third-party program I use. I appreciate the ability to scale-up the text to exactly the level favorable to my vision. Using your gadget, I have replaced three weather gadgets, thanks to the amount and types of information you've made available. Professional help with your online assignment.